LAS VEGAS – Washington played perhaps its worst half of basketball at the most inopportune time of the season, which resulted in a 68-48 defeat to Oregon in Saturday’s Pac-12 tournament title game. The Huskies (26-8) will spend the afternoon at coach Mike Hopkins’ house to watch the Selection Show that airs 3 p.m. on CBS and find out where their destination and opponent in next week’s NCAA tournament. Here are three impressions following the loss to the Ducks. Selection Sunday is Christmas Day for the so-called NCAA tournament bracket gurus who spend five months tabulating forecasts and predicting what the Selection Committee might do. We’ll find out shortly if the projections were accurate. Washington fell five spots to No. 45 in the NET rankings and they’re No. 22 in the old RPI. CBS college hoops reporter Jerry Palm says the Huskies loss pushes them closer to the bubble, but he still has Washington in the 68-team tournament. Here’s a sampling of where UW lands in the projections. — ESPN’s Joe Lunardi has the Huskies as a No. 8 seed facing No. 9 Seton Hall in the East region and playing in Columbia, S.C.
— Fox Sport’s Howie Schwab also has UW as a No. 8 seed in the West region against No. 9 Utah State. — SI.com’s Michael Beller dropped Washington to a No. 10 seed in the East region against No. 7 Louisville. — Palm has been down on the Huskies for awhile and his projections has UW as a No. 11 seed in the South region in San Jose, Calif. paired against No. 6 Buffalo. Good thing for the Huskies there’s little chance the Selection Committee slots them anywhere near Oregon. Pretty sure Washington wants nothing to do with its Pac-12 rival that’s riding an eight-game winning streak and dominated their past two matchups with a suffocating defense. A week ago, the Ducks spoiled UW’s regular-season finale filled with pre-game Senior Day celebrations and handed the Huskies an embarasing 55-47 defeat that snapped their 15-game home winning streak at Alaska Airlines Arena. And Saturday night, Oregon handcuffed the Huskies once again during a 68-48 blowout to capture the Pac-12 Tournament title and the automatic berth to the NCAA tournament. 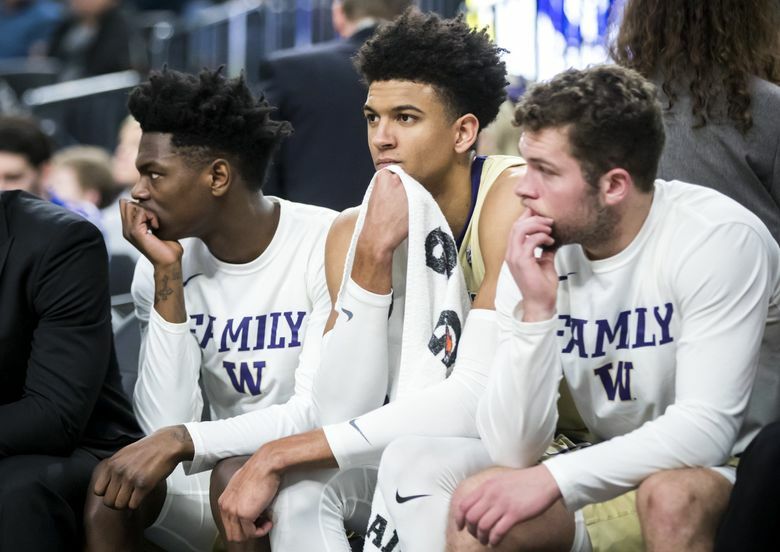 Led by Matisse Thybulle, the league’s two-time defensive player of the year, the Huskies pride themselves as a defensive team that ranked second in the league in points allowed. However, the Ducks take defense to another level thanks to its big front line of forwards Kenny Wooten, Francis Okoro and Louis King. It’s scary to think how good that defense would have been if 7-foot-3 freshman Bol Bol, a player of the year candidate, hadn’t suffered a season-ending foot injury in December. But Matt Calkins suspects UW has a scoring problem that could haunt them in the Big Dance. Not sure I’d go that far considering Washington put up 78 points on Thursday against an athletic USC team. The Huskies have proven they can win shootout games and close, grind-them-out defensive battles. But they haven’t been able to beat the Ducks in March. (UW won 79-69 at Oregon on Jan. 26). The Huskies would be well served to figure out how to get Noah Dickerson back on track. He collected 11 rebounds in the quarterfinals and semis, but averaged just five points in three tournament games. “I’ll be fine,” Dickerson said. The Huskies went into game concerned about their shoddy performance at the free throw in the previous two games when they hit 7 of 15 shots in quarterfinals and 17 of 27 in the semis. Turns out their worries were not a concern because Washington had very few chances at the charity stripe. The Huskies didn’t attempt a free throw in the first half. Their first foul shot was came with 7:30 left in the game. Washington hit 7 of 8 free throws while Oregon was 20 of 22. Strangely, the Huskies were limited to just eight free attempts twice before and they beat Utah (69-53) and Washington Sate (72-70).